Anatolian Shepherd dogs originate in the Anatolian plateau of Turkey. A plateau is a high, flat-topped mountain like Table Mountain. Summers are hot and dry, and winters are cold, but the Anatolian Shepherd Dogs live outside all year round. They were bred to guard sheep against predators, and are still used for this purpose. The breed still exists in Central Turkey. From ancient days they have defended sheep from dangerous animals like bears, and wolves. They have also been used as fighting dogs in wars, & as hunting dogs. They are large, imposing dogs, but not too heavy and fat to run fast! Agility is an important factor - not size alone. They must be able to stalk & chase a cheetah! Anatolian shepherds reach maturity at around 4 years of age. 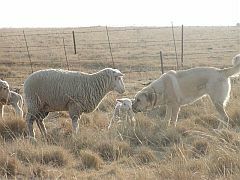 In Namibia & South Africa, Anatolian shepherd dogs are being used on farms to protect flocks of sheep & goats from jackal, caracal, leopard & cheetah. God created all the animals for a purpose. We only live on earth temporarily. Let's not shoot all the wild life, but use natural means like dogs to protect our assets! If we destroy all the small animals, the big predators will have no choice but to kill domestic animals for food. The cheetah is the fastest land animal, able to accelerate from standstill to 80km/h in only three seconds; its top speed is 120km/h. Their spines bunch up and release as they run, and their hips are flexible. At top speed, a cheetah does not touch the ground for eight meters. It is flying! Cheetah is the most endangered African cat. If these cats see a big dog, they are unlikely to approach! This is a much better way of controlling them than using cruel traps or poison. Tracy says, "She clears fences with ease so I have had to add electric strands to boundary fences. Gypsy by name, Gypsy by nature. She loves going to the beach and trots happily next to my bicycle when I go cycling. She is independent yet affectionate." Above: Slade, a male Anatolian, being exhibited at an open show. Males tend to carry their tales curled up high over their backs when they are alert. Slade carries his tail mostly high except when he's very relaxed or subdued. You can show an unregistered pure bred dog in an open show. There are no qualifications or cc's awarded. It's basically for fun. Anatolian Shepherds are alert, observant, and intelligent dogs. They are protective & possessive towards their families and territory. Care should be taken when friends visit! Careful bonding with the owner is necessary in puppyhood, in order to control a large dog when it is grown. This breed will not suit a meek, unassertive owner! The dog must not take charge of the owner! 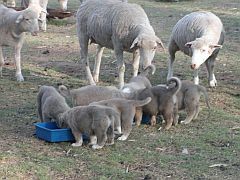 Anatolians excel at guarding flocks, and if they are to be used for this, they should not be treated as pets, but should live outside in all weathers with the flock, from a puppy. Thus the dog adopts the sheep as its family that it has to protect. One dog can protect a large flock of sheep. If they are pets, then a big, secure yard is needed, and they should be taken for walks or runs every day. All colour patterns and markings are acceptable, but the usual colors are fawn with a black mask, pinto, white and brindle. The dogs have black lips, a black or brown nose and muzzle. The almond shaped brown eyes may be outlined with black or brown. The head is big & broad. Ears normally hang down, but stand up when listening. The neck is thick & powerful. Anatolians have a solid robust neck, and Their legs are long and straight with muscular paws. Their tail hangs low and has a slight curl at the bottom. The back is short in proportion to the leg length. At the time of writing (July 2011) Anatolians are not registered with KUSA. Weight: Male: 110-150 lb., Female: 80-120 lb. 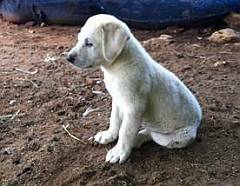 Below: Mufasa, an Anatolian puppy. 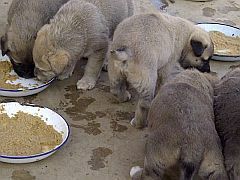 Owner Willie Bornman says, "I have a flock of 40 pregnant boerbok ooie to be guarded. My puppy is 8 weeks old and has lived with or next to the boerbokke from 6 weeks old. This is a learning curve for both Mufasa and me. I am very excited about our future together." An Anatolian shepherd dog will lay down its life for the sheep. Jesus said, "I am the good shepherd. The good shepherd lays down his life for the sheep...No one takes it from me, I lay it down of my own accord."